“Photography is a medium that typically hides its own materiality – we commonly look at an image rather than the material surface it appears to us on. Photography translates everything to surface, its depicted world flattened, the space is squeezed out of it. And yet it still usually looks like the world we know. This sets up tensions between the world and the image, the two and the three-dimensional, surface and mass, appearance and experience, etc”. BF: Your work has always been very sculptural. I purchased your axe piece “The Halt” sometime around 2009/10. It is a notable piece where a black piece of reflective exposed photographic paper has been pinned to the wall with an axe stroke. It seems at once to shatter norms of reflection and portraiture through the analysis of a mirrored surface. This act, though brutal, seems to consider of reckoning to that of image of self, audience, and the unconscious need for truth in photographic documents. Can you elaborate if you start your conceptual process through a three-dimensional form or is it that you start with “photographic thinking” and the play on representation? 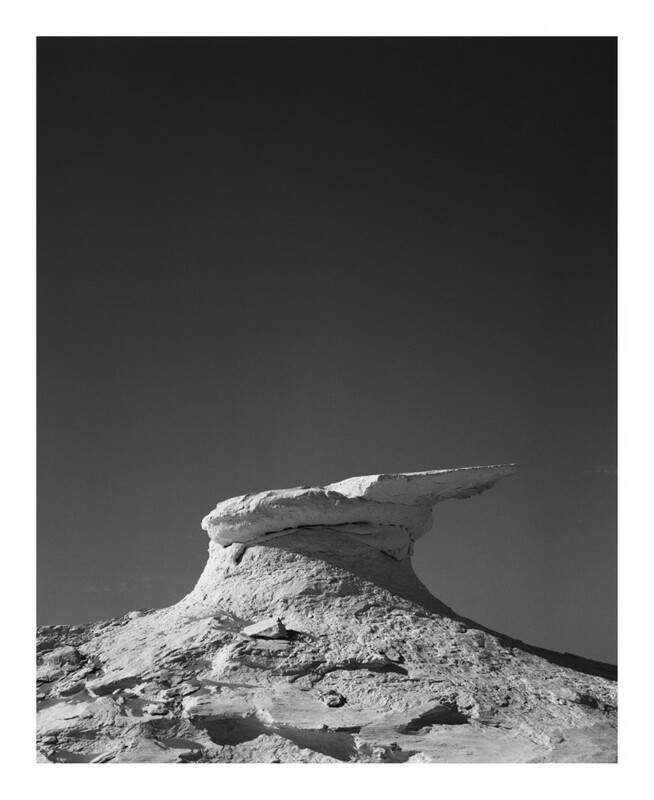 DHR: Photography is my effectively my primary language so I tend to think of it first and ask how other mediums and ideas can relate to it or be comparatively expressed through it. 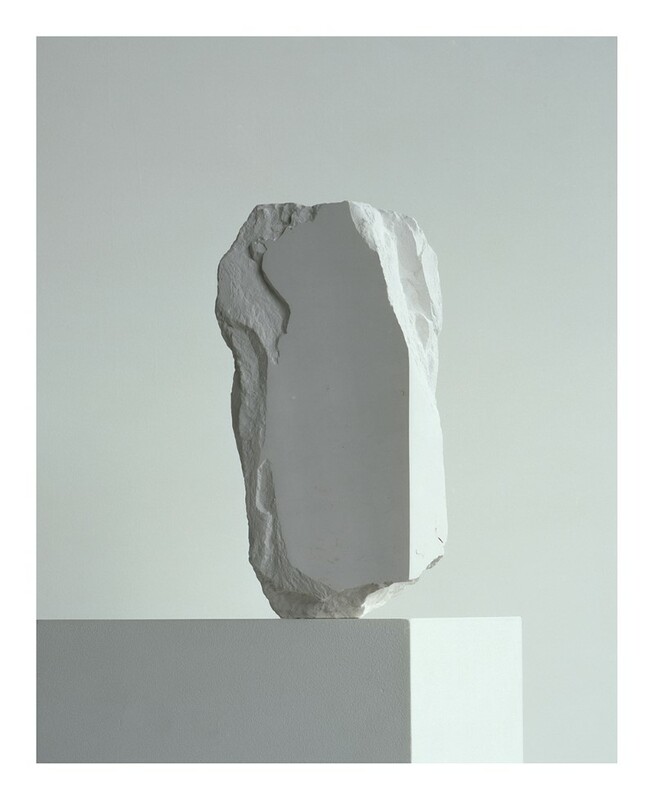 Sculptural works might develop for example, from thinking about photography’s typical characteristics and how they differ from or align with those of sculpture. Photography is a medium that typically hides its own materiality – we commonly look at an image rather than the material surface it appears to us on. Photography translates everything to surface, its depicted world flattened, the space is squeezed out of it. And yet it still usually looks like the world we know. This sets up tensions between the world and the image, the two and the three-dimensional, surface and mass, appearance and experience, etc. 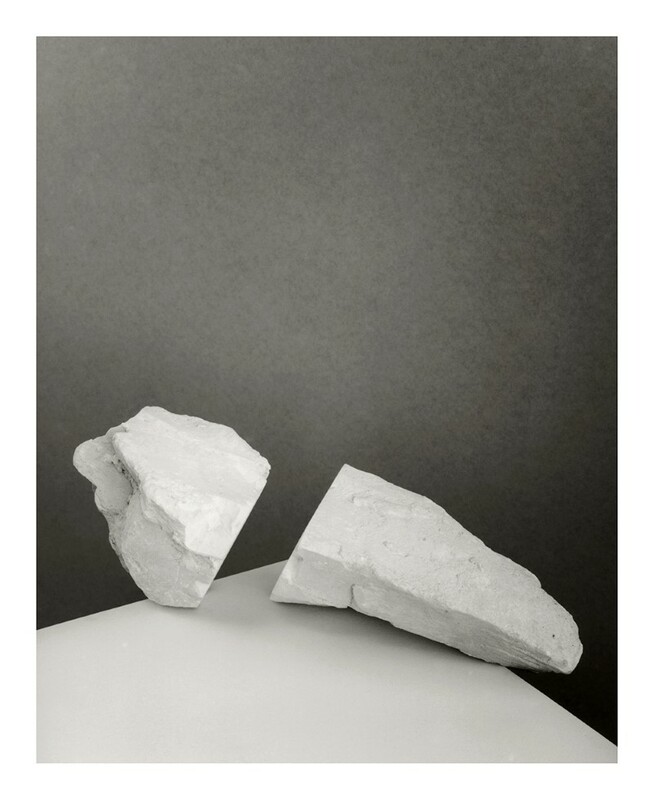 I feel like the encounter between photography and sculpture creates physical and conceptual spaces that interest me; it resonates with a type of ambiguity and cannot be entirely defined as one thing or another. 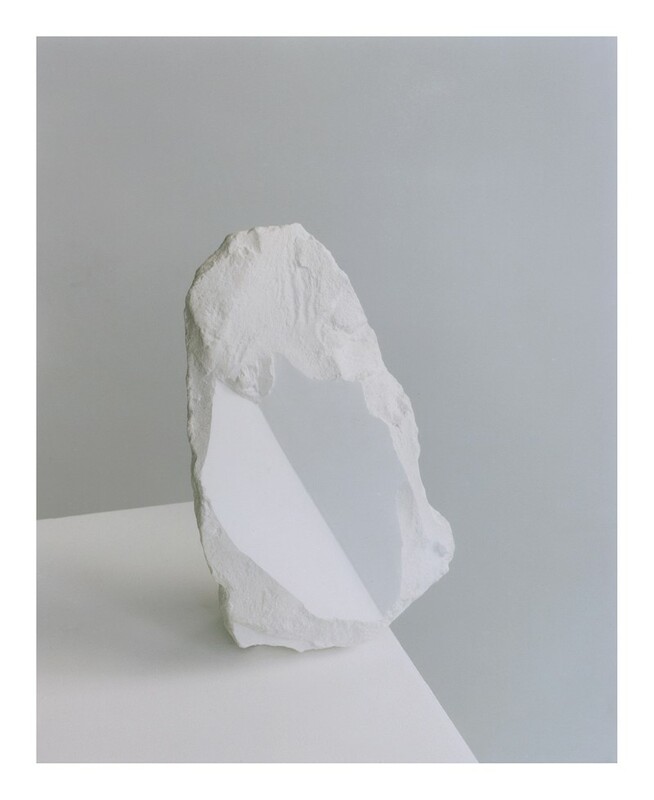 Also I feel like the two have different relationships to us, to the body and to the mind, the inner and outer life perhaps: sculpture is itself – material presence in immediate space and time; photography is ‘of’ something else – a thing, a space or a time that was. I think that means photography exists more in the mind, in relationship to ideas, memory and imagination while sculpture, in its presence, exists more in relationship to touch, to the body. 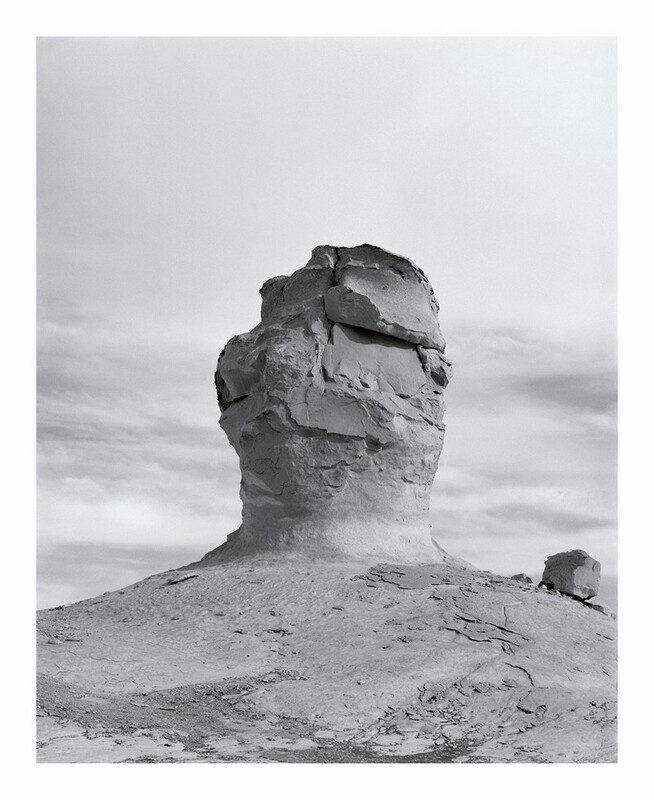 With that in mind, photographs of sculpture or ‘as’ sculpture become something subtly different again. Quite what I’m not exactly sure and perhaps it’s better to say that in my work I circle around that question rather than offer any answers. DHR: Interesting. Yes, I hope so. A playfulness with perception and a recognition of the way things slide along spectrums rather than jump between categories. The primary impetus for the work was drawn from Wilhelm Worringer’s 1906 doctrinal thesis ‘Abstraction and Empathy’ written before the advent of modern art but attempting to articulate a creative and perceptual intention, how we see and engage with the world as a spectrum comprised of the way we find and embrace it at one end – proposed as empathy – and the way we shape and withdraw from it – seen as abstraction – at the other. I felt like this encapsulated not only something at the heart of the photographic process but in my own outlook, the tension and the rationale to make work, a push and pull of opposites meaning that action and thought was never really at one end or other but sliding between. ‘Landscape’ for example, is an abstraction denoting a way of seeing – it’s both what we see and how we see. As is photography. As is the act of being in a world we continually interpret as well as experience. ” The primary impetus for the work was drawn from Wilhelm Worringer’s 1906 doctrinal thesis ‘Abstraction and Empathy’ written before the advent of modern art but attempting to articulate a creative and perceptual intention, how we see and engage with the world as a spectrum comprised of the way we find and embrace it at one end – proposed as empathy – and the way we shape and withdraw from it – seen as abstraction – at the other”. 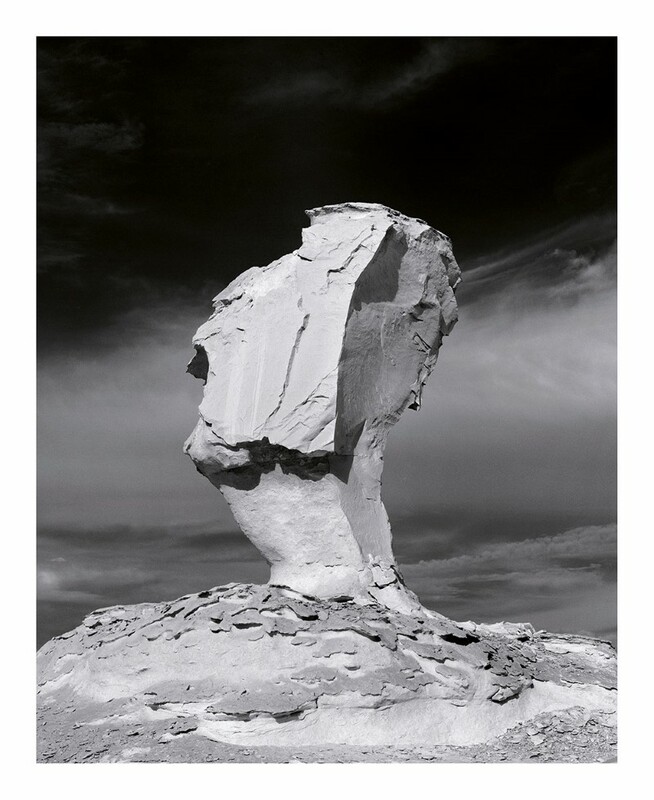 BF: Can you explain the series title “The Erratics”? Do you draw in the destructive possibilities of volcanic landscapes? DHR: In geology an erratic refers to a rock that differs to its native environment having been carried and deposited there by a long-vanished glacier. 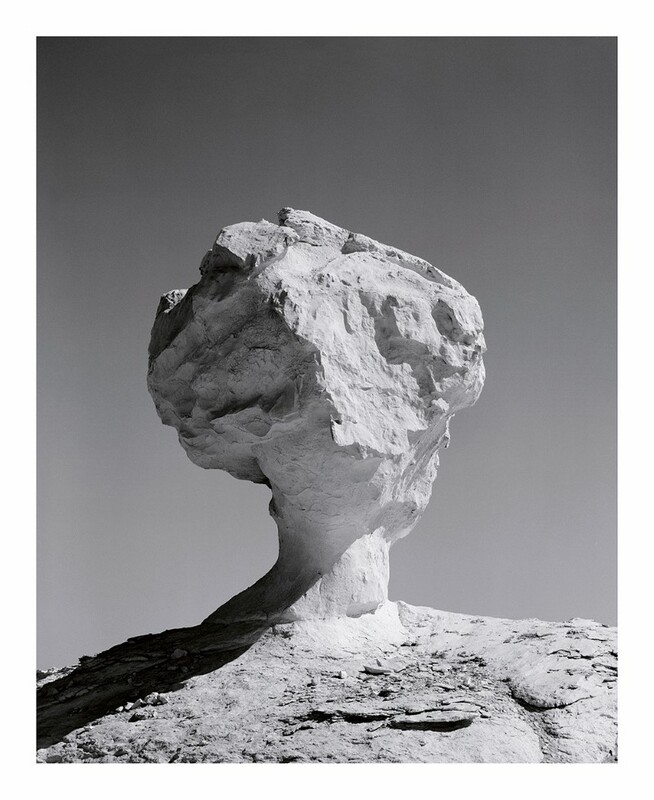 The natural formations I’ve photographed are actually chalk ventifacts in Egypt – rocks eroded by wind and sand – leaving the title to refer to the to my photographic act of lifting something from its environment. 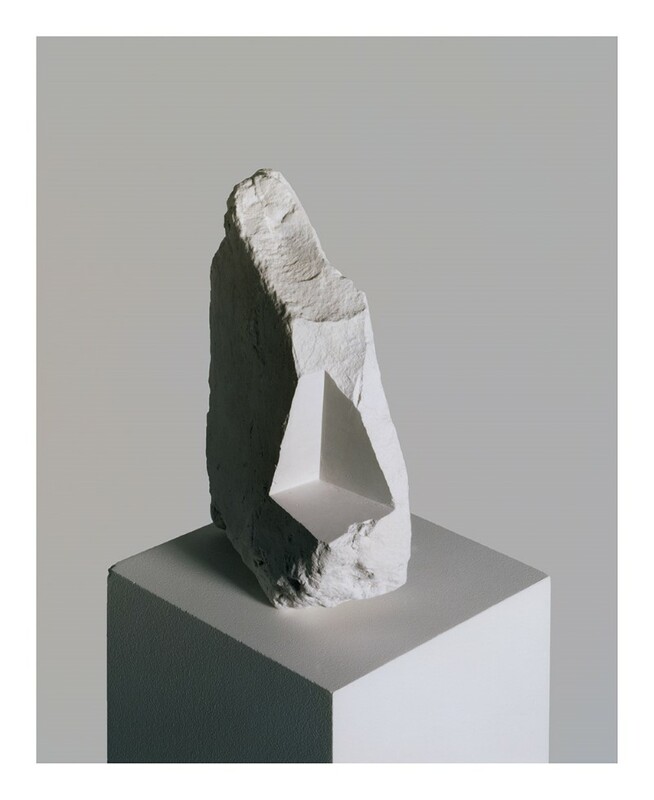 The sculptures are also chalk, collected from the cliffs along England’s south coast so the title can equally apply to the physical act of collecting and re-contextualizing them. Chalk is sedimentary, the accumulated, compressed and dried remains of miniscule plant forms that once floated on an ocean. The entire ocean is long since gone – the timeframe held and present in these formations is incomprehensible. 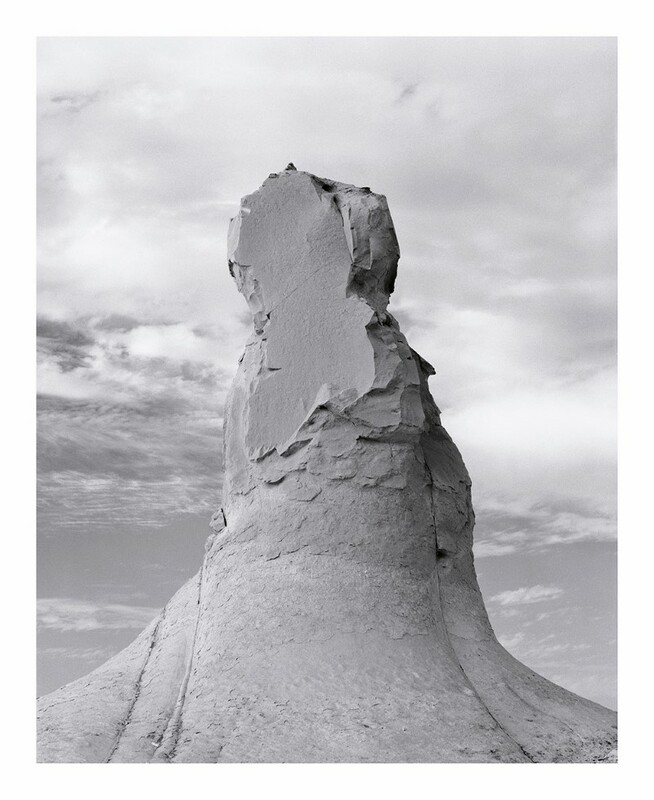 And I think of these natural chalk monoliths as a depiction of that time – as images even, their timeframe measured in lifetimes where photography deals in seconds. And then within that context the act of gathering, carving and shaping my collected chalk fragments takes on a particular poetry. I see this in terms of an empathetic gesture, an identification rather than a destruction – putting myself into this continuum of things and processes that are so far beyond me, that extract from a past and create a present. That gesture then becomes abstract or empathetic, depending how you look at it. 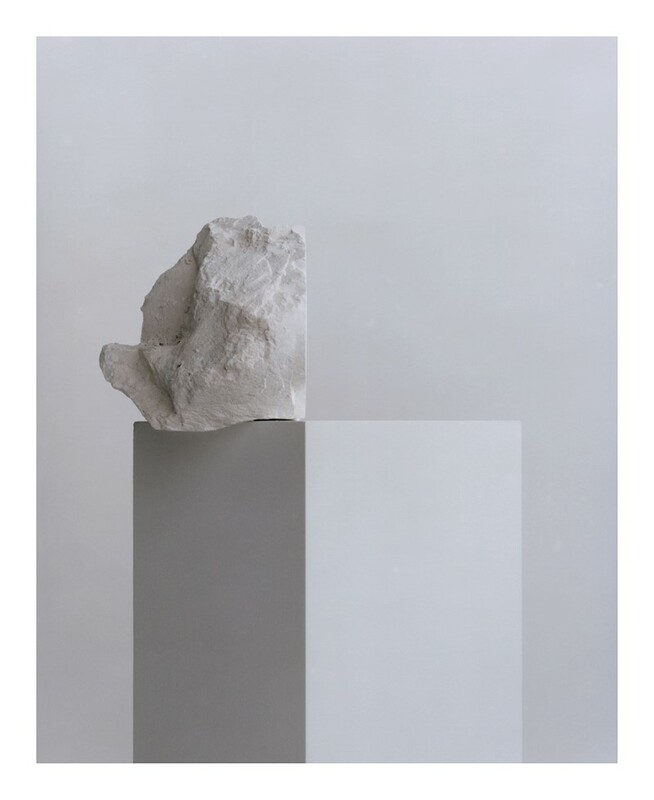 BF: I see also that as with your show previously at Summaria/Lunn in London a few years back that the plinth becomes an essential component not only of photographing your objects, but also in their physical display. It is perhaps an awkward question, but are the armatures as important for the display of the piece as the entirety of the piece of itself? The recurring plinth, yes, I can’t seem to tear myself away from it! It’s a continual consideration and therefore certainly part of the entirety of the piece, even more so in this work than previously. The plinth, like the frame, is a presentation default. I’m not scared of using either but I’m certainly careful the choice is made rather than assumed. It’s been a conscious decision in this work to move closer than I ever have to the traditional conventions of presentation as component elements – photographs in frames, sculptures on plinths – in part because I wanted to embrace my own relationship to a direct and perhaps more traditional means of using mediums. Part of this work is about my own acceptance of convention, a certain joy and directness in the medium and its process that I want to foreground and not hide behind overly conceptual language or consciously different/alternative display. This, to me at least, relates to the idea of empathy, of embracing things as they are, as openly as possible. But at the same time it’s an empathy on a spectrum with abstraction as its correlative and it’s always sliding towards that, formally, conceptually, personally, poetically. 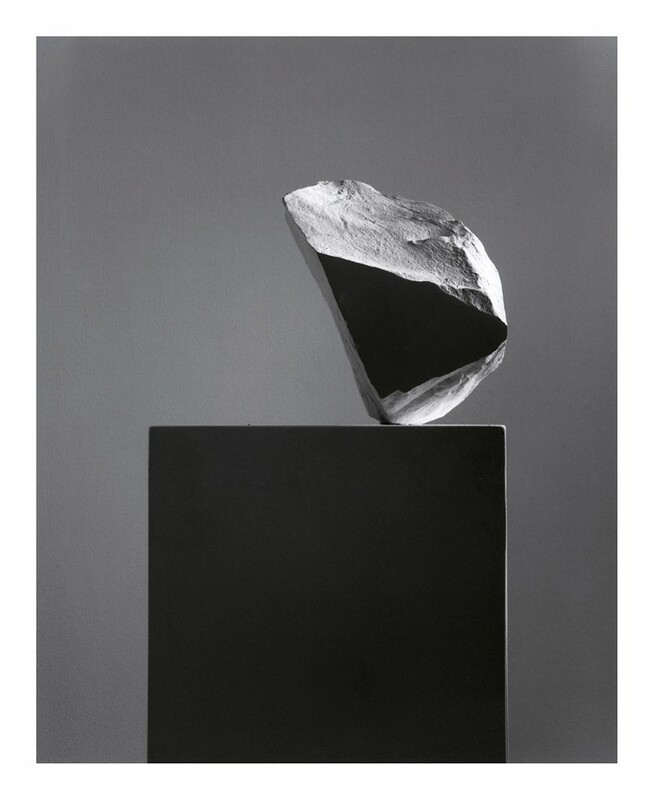 So the framed photographs I still see as objects, and the geometric formality of the plinth is flattened into pure line within them, used to highlight a collapsing of three dimensions to two, the chalk having been carved towards this same collapse, the object shaped towards its translation to image. In my coming exhibition at Copperfield other sculptures atop plinths will echo what the images do but in reverse, that is present objects that hold something of the two-dimensional in the way they’ve been been carved. BF: There is a…. mutability in many of your works in terms of colour. Things become minimal or reduced, which in contemporary practice seems to be a bit of an anathema. Large colourful works seem to be, even if sculptural, a trend that is very current, where in contrast, I find the reduction of this element in your work very powerful. Can you explain why the work, in your practice, calls for a near monochromatic scale? DHR:I seem to have gradually developed a fairly minimal and elegant aesthetic, my backgrounds, lighting, palette, installation, etc. being less about enhancing the subject and more about as unimpeded a ‘showing’ as possible. It’s been a natural result of my work’s focus rather than a conscious choice, understanding it therefore being a bit like speculative introspection. Perhaps when you consider that the dominant means through which we encounter objects in photography would be in the flattering clamour of advertising. Against that approach I’ve found myself resisting the idea of embellishment and aiming for an uncontested clarity in which the subject can be apprehended as much in its own terms as possible. I think this creates a more consciously quieter aesthetic and greater sense of focus, of the eyes and the mind being drawn into the one space. It’s perhaps a visual way of directly asking what are seeing, an apperceptive question. BF: One last question…tell me what you are looking forward to at this year’s Unseen? Any artist’s you are looking forward to seeing? There’s been such a broad scope within the work at Unseen in the past, a really rich sense of the past being rediscovered and of futures anticipated, a tapestry of ideas and inspirations that has somehow come together to form a vibrant picture of how photography lives as an art form today. It’s just being within that I look forward to, rather than any individual thread. Darren Harvey-Regan is a graduate of the Royal College of Art. His work has appeared in exhibitions and publications internationally and is part of the permanent photography collection at the Victoria and Albert Museum, London. His solo exhibitions include The Erratics, Passaggi, Pisa (2015), A Shifting Sense of Things, Sumarria Lunn, London (2013), Phrasings, The Ravestijn Gallery, Amsterdam (2013), A Collection of Gaps, Phoenix, Exeter (2011) and Fact, Room Gallery, London (2011). Group shows include Act & Application, Lawrie Shabibi, Dubai, UAE (2014), GeoGráfica, FOTOTROPIA, Guatemala City, GT (2013), Object Dada, Edel Assanti, London (2011), Catlin Art Prize, London (2011), New Contemporaries, ICA, London (2010). Darren Harvey-Regan is a recipient of the Leverhulme Trust Award (2009) and is part of the Hal Silver collective. His works will be on view during Unseen with The Ravestijn Gallery. Posted in Interviews and tagged Darren Harvey-Regan, Sculpture, Sculpture Based Photography, The Ravestijn Gallery, UnseenASX, Wilhelm Worringer.